Up, up and away! A kite themed boy’s first birthday party is the perfect way to celebrate how quickly the first 12 months literally fly by with a new little one. 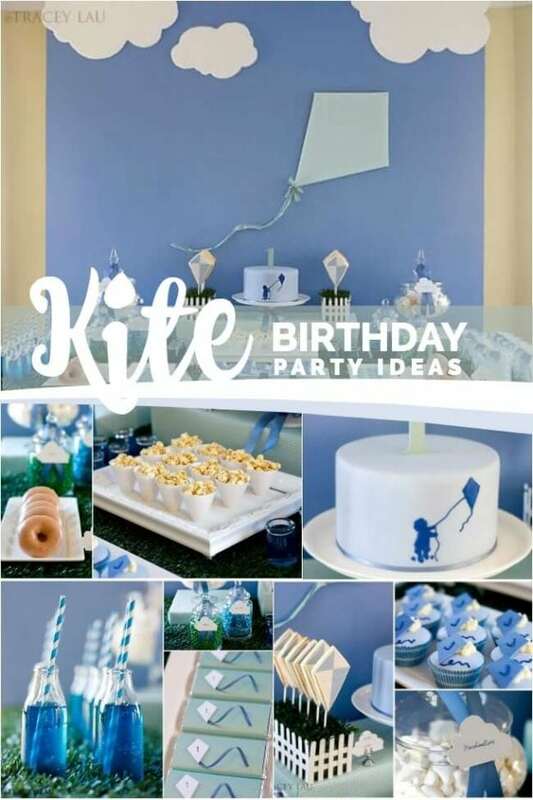 You’ll be smitten with the adorable kite details planned by the uber-talented Tracey Lau for her son’s first birthday party. The decorations, birthday cake, and favors all combine for one sweet first birthday celebration. 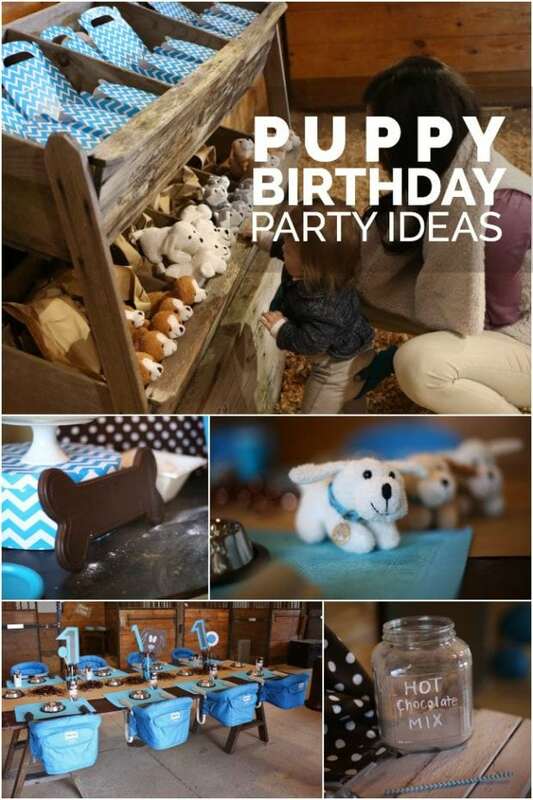 Looking for a unique first birthday party idea? How about planning a party around your child’s favorite book like this Pajama Time boy’s first birthday party? Add a nautical twist to your celebration with ideas found in this boy’s nautical birthday party. Pinpointing what I love most about this party is tough. Every detail is fabulous and perfectly executed. 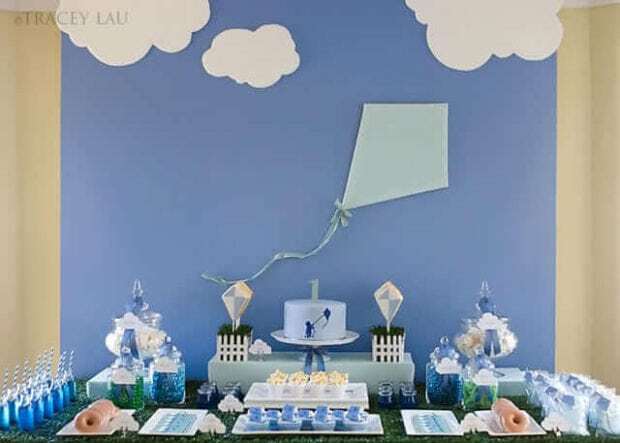 I love the simplicity of the backdrop: blue sky, accented with white paper clouds and a pretty pastel blue kite. 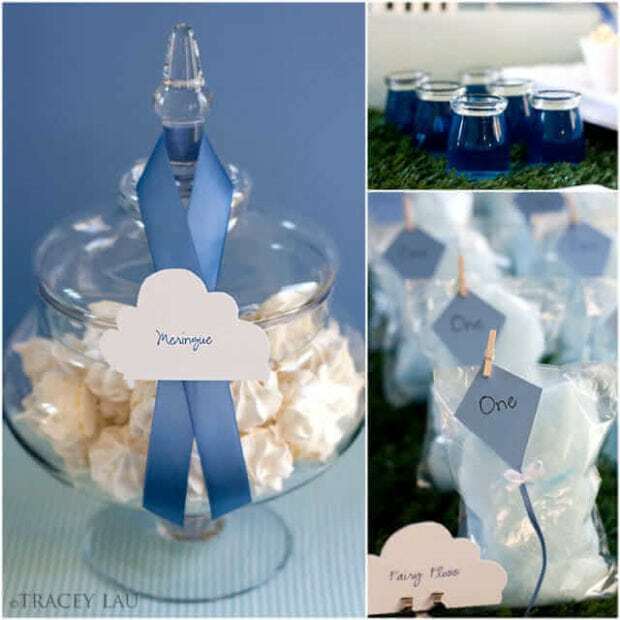 Below, a faux grass table covering gives way to an array of treats and sweets, each adorably labeled with cloud shaped food labels. I’m a fan of food coordinating with the theme. Tracey did not disappoint. Apothecary jars were filled with cloud shaped marshmallows. 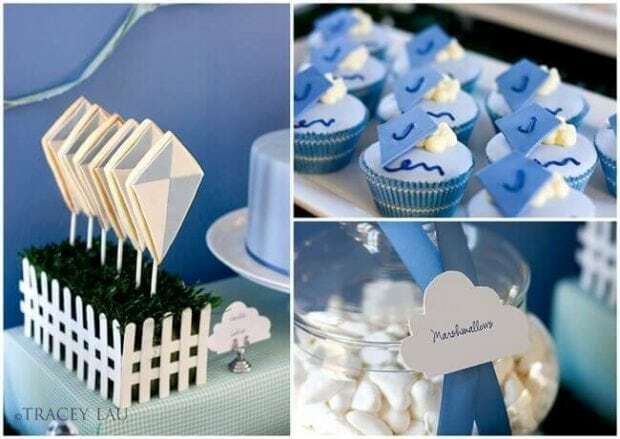 Kite cookie pops were bolstered in a small patch of faux grass with a white picket fence—what an adorable display. 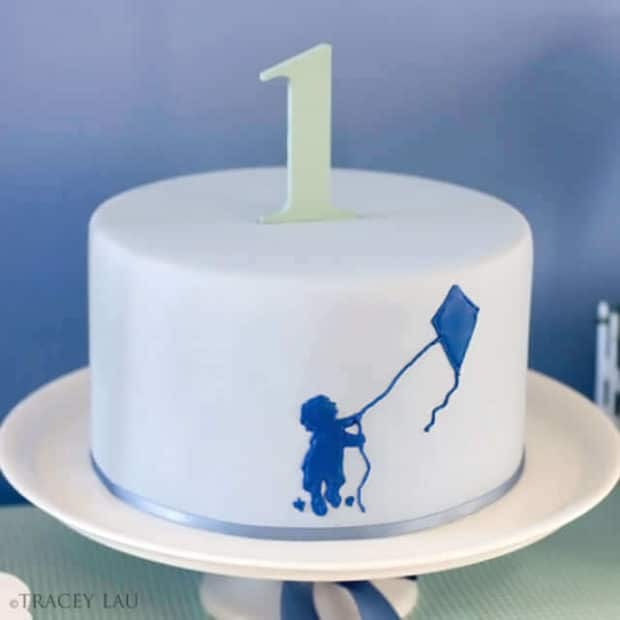 An elegant cake was created in shades of blue with a simple silhouette of a boy flying his kite. Such a precious scene to be recreated on a cake. The cake was finished off with a #1 topper. The cutest cupcakes were served in striped liners and topped with darling fondant kites. Candy jars were filled with color-coordinating candies. Can there ever be enough? Rows of donuts and kite-embellished candy bars were just a couple of the sweet additions to the dessert table. I just love the #1 on each little kite—such a fun personalization. 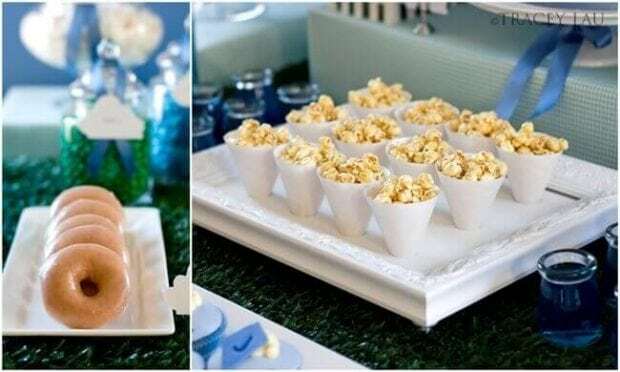 Blue Jello, miniature cups of caramel corn, meringues, and puffs of cotton candy were additional tempting treats. Glass bottles showcase blue soda and festive striped straws. Perfect! Guests enjoyed decorating their own kites prior to moving outside to fly them. Sounds like a perfect way to celebrate a boy’s first birthday to me. Planning a boy’s first birthday party? Don’t miss these perfect first birthday party products curated by the Spaceships and Laser Beams crew. 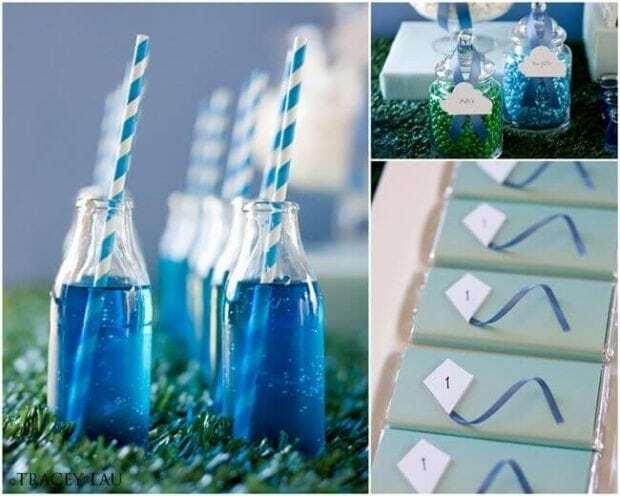 Be sure to check out more boy’s first birthday party ideas here.